“Entries” are the data collection from the users via forms. 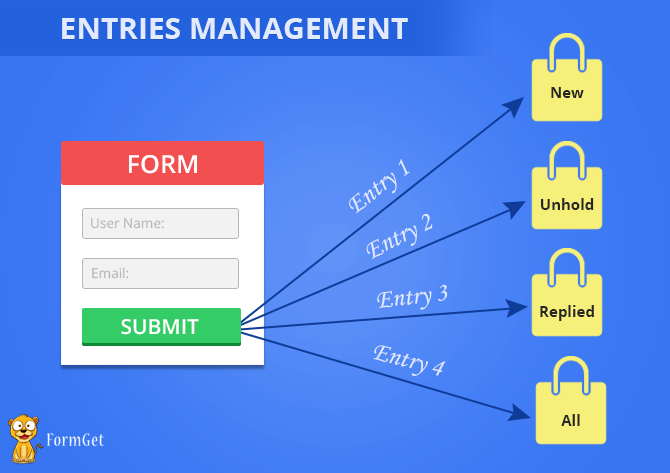 FormGet entry manager lets you manage forms from a single dashboard and that too very easily and effectively. New Messages: Here, the fresh entries get stored. On Hold: Sometimes you may not be able to completely solve out some query at the moment. You can move such conversations to this section. All your ongoing conversations that are likely to be more important will be at one place only. Replied: Once you have answered a query, it will be moved to the ‘Replied’ section. All Messages: All the messages are listed here.